I too have an OptiPlex 9020, and am adding an SSD. 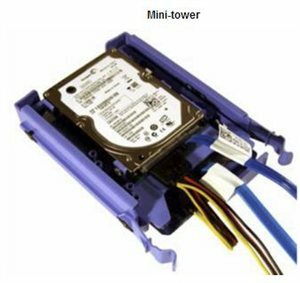 If you don't have an optical drive, you can buy an optical caddy (e.g. http://www.amazon.com/dp/B00FWOR638/) that will allow you to place it where the optical drive goes, and it will hold a 2.5" drive (either a laptop HDD or an SSD). The nice thing is that this caddy will convert the power pins from the 15-pins (power) that your SSD requires to the 6-pins (power) that the PSU would supply for the optical drive using a red & black cable. There's no conversion required for the data pins, as they are the standard 7 pins for SATA. I've ordered my 9020 without an optical drive, and have still received it with a extra 7-pin SATA data cable, and the 6-pin SATA slimline power cable (i.e. I have another pair of SATA power/data cables running to the HDD). If you're having trouble finding the optical power cable, try tracing the HDD power cable back to the motherboard - you'll find the red/black power cable for the optical drive spliced into it. Another option (what I'm doing) is to avoid using a caddy. Instead, I'm just taping my SSD within the ODD enclosure. I use the second SATA data cable provided to connect to the SSD. I've ordered a Y-cable (http://www.amazon.com/dp/B002N2EHVQ/) to split the SATA power that goes to the HDD to also feed the SSD. I'm doing this because I'm not certain about how well caddies work, and don't want other electronics (of dubious quality) coming between the SSD and motherboard. A general tip - If you're using the SSD as your boot/OS drive, I'd recommend you ensure that the SATA0 port is connected to the SSD and SATA1 to the HDD. 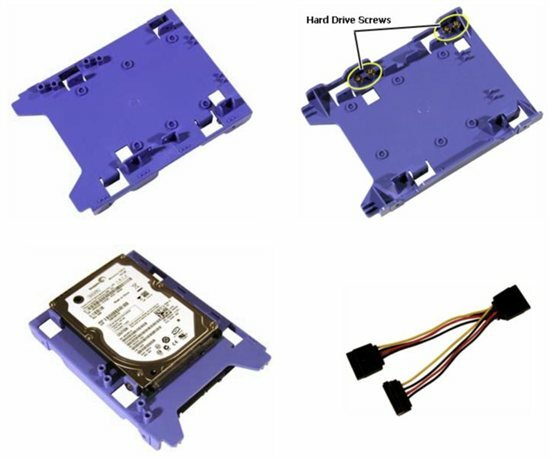 As shipped, SATA0 connects to the HDD and SATA1 to the ODD. So you'll need to swap the connections around when adding an SSD. The ssd caddy sits inside the 3.5 inch caddy and holds 2 drives like a matruska doll. One on top and one underneath. The Optiplex 3020 7020 9020 R494D 2.5 inch caddy fits inside the DN8MY 3.5 inch blue caddy. The Silverstone adapter has all the mount points of a standard 3.5" hard drive, and it's only $8 with free shipping. It holds two 2.5" devices stacked.